Essex Crane Rental Corp. (“ECRC” or the “Company”), founded in 1960, is one of North America’s largest bare rental crawler crane providers. ECRC specializes in heavy lift capacity cranes with lift capabilities ranging from 100 to 440 tons, and also offers specialty attachments that can increase lift capacity up to 660 tons. The Company utilizes its diverse geographic footprint across the United States to service customers throughout North America. The Company’s cranes are used primarily in construction activities, including large infrastructure and industrial projects. While utilization of hydraulic cranes has rebounded and been trending upwards since 2010, continued under-utilization in the conventional crane fleet negatively impacted the overall fleet’s utilization. The existing capital structure severely constrained cash flow and management’s ability to re-invest in growth through replacement of the rental fleet, particularly the older conventional models. SSG was retained as ECRC’s exclusive investment banker in December 2015. SSG conducted a comprehensive marketing process, contacting a broad universe of strategic and financial buyers to achieve an optimal outcome for the Company and its key stakeholders. 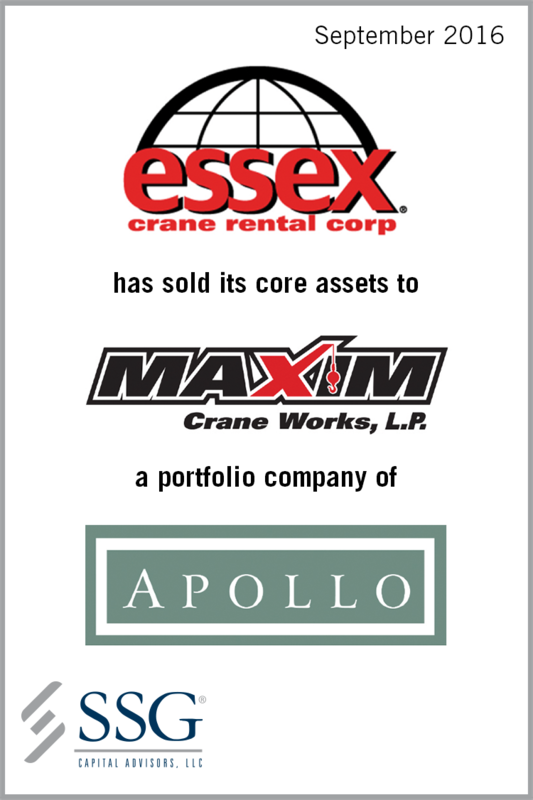 The process attracted significant interest from the market with Maxim Crane Works, L.P. (“Maxim”), a portfolio company of Apollo Global Management, ultimately submitting the most compelling offer to ECRC and its stakeholders. The sale was effectuated through Article 9 of the Uniform Commercial Code and closed in September 2016. Subsequent to the sale to Maxim, SSG also assisted Essex’s stakeholders in selling the Company’s non-core assets to Walter Payton Power Equipment, LLC.